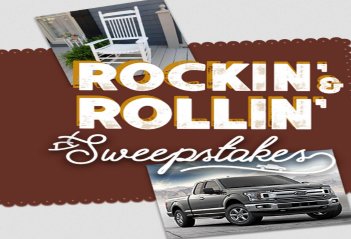 Cracker Barrel Old Country Store Rockin’ & Rollin’ Sweepstakes -Win a 2018 Ford F-150 XLT full-size pickup truck! Win a 2018 Ford F-150 XLT full-size pickup truck with chrome package! ENTER SWEEPSTAKES HERE – Cracker Barrel Sweepstakes page. ENTRY LIMIT – Limit one (1) Entry per person per day, regardless of method. ELIGIBILITY – The Cracker Barrel Old Country Store Rockin’ & Rollin’ Sweepstakes (“Sweepstakes”) is open only to legal residents of the fifty (50) United States and the District of Columbia who are at least eighteen (18) years old at the time of Entry. SWEEPSTAKES ENTRY PERIOD – The Sweepstakes begins at 12:00:01 a.m. Eastern Time (“ET”) on September 28, 2017 and ends at 11:59:59 p.m. ET on January 5, 2018. PRIZES – One (1) Grand Prize winner will receive a 2018 Ford F-150 XLT full-size pickup truck with chrome package, ARV: $37,000. One Hundred (100) Daily Prizes: 1. Sept. 28: Drag Racing Alarm and 100 Yrs. Travel Mug, ARV: $32.98; 2. Sept. 29: Ford Mustang Record Player, ARV: $149.99; 3. Sept. 30: Bronco T-shirt and NASCAR Ford 1/24 Diecast Model, ARV: $64.99; 4. Oct. 1: Ford F Series Pickups Book and Ford hat, ARV: $44.99; 5. Oct. 2: Genuine Ford Tin Button Wall Sign and NASCAR Ford 1/24 Diecast Model, ARV: $89.99; 6. Oct. 3: Ford Motor Co. Navy t-shirt and Ford Motor Co. Two Grey Hat, ARV: $29.98; 7. Oct. 4: Ford Key Rack and Ford hat, ARV: $39.99; 8. Oct. 5: Ford Motor Co. Navy T-shirt and Ford Motor Co. Two Grey Hat, ARV: $29.98; 9. Oct. 6: Ford Shot Glass Set and Ford hat, ARV: $34.99; 10. Oct. 7: Bronco T-shirt and NASCAR Ford 1/24 Diecast Model, ARV: $64.99; 11. Oct. 8: Ford Neon Clock, ARV: $79.99; 12. Oct. 9: Ford Trucks Collage Tin Sign and Ford hat, ARV: $34.99; 13. Oct 10: These Colors Run True t-shirt and Navy F150 hat, ARV: $31,98; 14. Oct. 11: Wall Mount Bottle Opener, ARV: $24.99; 15. Oct 12: Ford Mustang Record Player, ARV: $149.99; 16. Oct 13: Bronco T-shirt and NASCAR Ford 1/24 Diecast Model, ARV: $64.99; 17. Oct 14: F Series Pickups Book and_ Ford Hat, ARV: $44.99; 18. Oct 15: Ford Key Rack and Ford hat, ARV: $39.99; 19. Oct 16: Wall Mount Bottle Opener and NASCAR Ford 1/24 Diecast, ARV: $74.99; 20. Oct 17: Built Ford Tough Blue t-shirt and Ford trucks black hat, ARV: $29.99; 21. Oct 18: Ford Trucks Lamp, ARV: $59.99; 22. Oct 19: Drag Racing Alarm and 100 Years Travel Mug, ARV: $32.98; 23. Oct 20: Ford Trucks Collage Tin Sign and Ford hat, ARV: $34.99; 24. Oct 21: These Colors Run True T-shirt and Navy F150 hat, ARV: $31.98; 25. Oct 22: Ford Neon Clock, ARV: $79.99; 26. Oct 23: Ford Trucks Collage Tin Sign and NASCAR Ford 1/24 Diecast Model, ARV: $69.99; 27. Oct 24: Ford Thermometer, ARV: $29.99; 28. Oct 25: F Series Pickups Book and Ford Hat, $44.99; 29. Oct 26: Bronco T-shirt and NASCAR Ford 1/24 Diecast Model, $64.99; 30. Oct 27: Ford Mustang Record Player, ARV: $149.99; 31. Oct. 28: Ford Motor Co. red t-shirt and Ford Motor Co. blue hat, ARV: $29.98; 32. Oct 29: Ford Service Arrow Sign and Ford hat, $39.99; 33. Oct 30: Drag Racing Alarm and 100 Years Travel Mug, $32.98; 34. Oct 31: Ford Trucks Collage Tin sign and Ford hat, $34.99; 35. Nov. 1: These Colors Run True t-shirt and Navy F150 hat, ARV: $31.98; 36. Nov. 2: Ford Neon clock, ARV: $79.99; 37. Nov. 3: Ford Shot Glass Set and Ford hat, $34.99; 38. Nov 4: Ford Rocker, ARV: $199.99; 39. Nov 5: F Series Pickups Book and Ford Hat, ARV: $44.99; 40. Nov 6: Ford Sweatshirt and Ford Navy Knit Hat, ARV: $42.98; 41. Nov 7: Built Ford Tough Blue t-shirt and Ford trucks black hat, ARV: $29.99; 42. Nov 8: For 100 Year Black t-shirt and Ford 100 Year black mug, $24.98; 43. Nov 9: Ford Service Arrow sign and Ford hat, ARV: $39.99; 44. Nov 10: Ride on Shelby Car, ARV: $129.99; 45. Nov 11: Ford Trucks Collage Tin Sign and Ford hat, ARV: $34.99; 46. Nov 12: These Colors Run True t-shirt and Navy F150 hat, ARV: $31.98; 47. Nov 13: Built Ford Tough Blue t-shirt and Ford trucks black hat, ARV: $29.99; 48. Nov 14: Ford Mustang Record Player, ARV: $149.99; 49. Nov 15: Ford Thermometer, ARV: $29.99; 50. Nov 16: F Series Pickups Book and Ford Hat, ARV: $44.99; 51. Nov 17: Ford Sweatshirt and Ford Navy Knit Hat, ARV: $42.98; 52. Nov 18: Bar stool, ARV: $79.99; 53. Nov 19: These Colors Run True t-shirt and Navy F150 hat, ARV: $31.98; 54. Nov 20: Ford Service Arrow Sign and Ford hat, ARV: $39.99; 55. Nov 21: Ford 100 Year Black t-shirt and Ford 100 Year black mug, ARV: $24.98; 56. Nov 22: Ford Trucks Collage Tin Sign and Ford hat, ARV: $34.99; 57. Nov 23: These Colors Run True t-shirt and Navy F150 hat, ARV: $31.98; 58. Nov 24 NASCAR Ford 1/24 Diecast model and Ford Hat, ARV: $65.00; 59. Nov 25: Ford Mustang Record Player, ARV: $149.99; 60. Ford Motor Company Navy t-shirt and Ford Motor Company Two Grey Hat, ARV: $29.98; 61. Nov 27: Drag Racing Alarm and 100 Years Travel Mug, ARV: $32.98; 62. Nov 28: Ford Men’s Workwear Shirt, ARV: $49.99; 63. Nov 29: Ford Motor Company red t-shirt and Ford Motor Company blue hat, ARV: $29.98; 64. Nov 30: Ford half-gallon water cooler and Ford Hat, ARV: $40.00; 65. Dec 1: Ford 100 Year Black t-shirt and Ford 100 Year black mug, ARV: $24.98; 66. Dec 2: Ford V8 Wood Sign and Ford Hat, ARV: $45.00; 67. Dec 3: Ford Thermometer and Ford hat, ARV: $45.00; 68. Dec 4: Ford Motor Company red t-shirt and Ford Motor Company blue hat, ARV: $29.98; 69. Dec 5: Ford Ride On Red Truck, ARV: $129.99; 70. Dec 6: Ford Motor Company Navy t-shirt and Ford Motor Company Two Grey Hat, ARV: $29.98; 71. Dec 7: Ford Shot Glass Set and Ford hat, ARV: $34.99; 72. Dec 8: Drag Racing Alarm and 100 Years Travel Mug, ARV: $32.98; 73. Dec 9: Ford Motor Company red t-shirt and Ford Motor Company blue hat, ARV: $29.98; 74. Dec 10: Ford Service Arrow Sign and Ford hat, ARV: $39.99; 75. Dec 11: Mustang t-shirt and Mustang Hat, ARV: $29.98; 76. Dec 12: Ford Mustang Record Player, ARV: $149.99; 77. Dec 13: Ford 100 Year Black t-shirt and Ford 100 Year black mug, ARV: $24.98; 78. Dec 14: Built Ford Tough Blue t-shirt and Ford trucks black hat, ARV: $29.99; 79. Dec 15: Ford Rocker, ARV: $199.99; 80. Dec 16: Ford Motor Company Navy t-shirt and Ford Motor Company Two Grey Hat, ARV: $29.98; 81. Dec 17: Ford Thermometer and Ford Hat, ARV: $45.00; 82. Dec 18: Mustang t-shirt and Mustang Hat, ARV: $29.98; 83. Dec 19: Wall Mount Bottle Opener and NASCAR Ford 1/24 Diecast, ARV: $74.99; 84. Dec 20: Mustang t-shirt and Mustang Hat, ARV: $29.98; 85. Dec 21: Built Ford Tough Blue t-shirt and Ford trucks black hat, ARV: $29.99; 86. Dec 22: Drag Racing Alarm and 100 Years Travel Mug, ARV: $32.98; 87. Dec 23: Ford 100 Year Black t-shirt and Ford 100 Year black mug, ARV: $24.98; 88. Dec 24: Ford Neon Clock, ARV: $79.99; 89. Dec 25: Ford Motor Company red t-shirt and Ford Motor Company blue hat, ARV: $29.98; 90. Dec 26: Ford Mustang Record Player, ARV: $149.99; 91. Dec 27: Ford Thermometer, ARV: $29.99; 92. Dec 28: These Colors Run True t-shirt and Navy F150 hat, ARV: $31.98; 93. Dec 29: Ford Service Arrow Sign and Ford hat, $39.99; 94. Dec 30: Built Ford Tough Blue t-shirt and Ford trucks black hat, ARV: $29.99; 95. Dec 31: Ford Thermometer, ARV: $29.99; 96. Jan 1: Ford Motor Company red t-shirt and Ford Motor Company blue hat, ARV: $29.98; 97. Jan 2: Bar Stool, ARV: $79.99; 98. Jan 3: Built Ford Tough Blue t-shirt and Ford trucks black hat, ARV: $29.99; 99. Jan 4: Mustang t-shirt and Mustang Hat, ARV: $29.98; 100. Jan 5: Drag Racing Alarm and 100 Years Travel Mug, ARV: $32.98. Daily Prizes will only be shipped to a street address in the 50 United States or the District of Columbia. No cash equivalent is otherwise available for a Daily Prize. 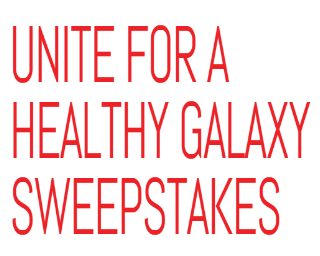 Dole Unite For A Healthy Galaxy Sweepstakes – Win Star Wars Figures worth $1,000! ENTRY LIMIT – After completing any of the five (5) forms of entry, you will receive one (1) entry into the Promotion. ELIGIBILITY – The “Dole Unite For A Healthy Galaxy” Sweepstakes (the “Promotion” or “Sweepstakes”) is open only to legal residents of the 50 U.S. states and the District of Columbia, as well as legal residents of Canada, who are at least 18 years of age (or legal age of majority in jurisdiction of residence, whichever is older), as of date of entry/sign-up. SWEEPSTAKES ENTRY PERIOD – The Promotion begins on/about 12:00 p.m. (noon) Pacific Time (PT) October 8, 2017 and ends on 11:59 p.m. PT February 16, 2018. Eighteen (18) Weekly Prizes: each weekly prize winner to receive one (1) voice-activated, remote-control Spin Master BB-8. Total ARV of each weekly prize, $200 [USD]. Total ARV of all weekly prizes being awarded is $3,600 [USD]. Total ARV of all prizes. $4,600 [USD]. 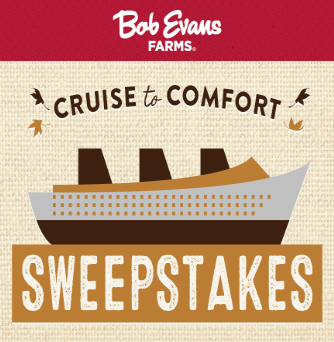 Bob Evans Cruise to Comfort Sweepstakes & IWG – Win a Bahama cruise! Win a cruise to the Bahamas! ENTER SWEEPSTAKES HERE – Bob Evans Sweepstakes page. ENTRY LIMIT – Limit: Each entrant may enter the Sweepstakes one (1) time per day and play the Instant Win Game one (1) time per day during the Promotion Period. ELIGIBILITY – Cruise to Comfort Sweepstakes (the “Promotion”) is open only to legal residents of the fifty (50) United States (including District of Columbia) who are at least eighteen (18) years old at the time of entry. PRIZES – ONE (1) GRAND PRIZE: A Bahamas Cruise for winner and one (1) guest. to availability and blackout dates. Travel must be round trip. Approximate Retail Value (“ARV”): $5,800. Actual value may vary based on airfare fluctuations and distance between departure and destination. ONE (1) FIRST PRIZE: Bob Evans Dinners for a Year awarded as a $1,500 gift card. ARV: $1,500. FIFTEEN (15) SECOND PRIZES: A “Comfort” prize package consisting of two (2) mugs, a t-shirt, a farm friend plush toy, and coffee. ARV: $35. card. ARV of each Third Prize: $25. ONE HUNDRED FIFTY (150) FOURTH PRIZES: $15 Bob Evans gift card. ARV of each Fourth Prize: $15. TWO HUNDRED (200) FIFTH PRIZES: $10 Bob Evans gift card. ARV of each Fifth: $10. 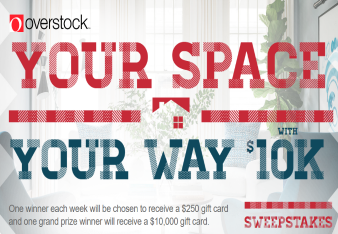 Overstock Your Space Your Way $10K Sweepstakes – Win $10,000! SWEEPSTAKES ENTRY PERIOD – Beginning at 9:00 a.m. Eastern Time (“ET”) on October 2, 2017 until 5:00 p.m. ET on November 22, 2017, you may enter Your Space Your Way $10K Sweepstakes. Balsam Hill Grand Country Christmas Sweepstakes – Win a trip to Nashville & more! Win a trip to Nashville, tickets to the CMA County Christmas live taping and more! ENTRY LIMIT – Limit one registration per person. Earn more entries by completing social media tasks and sharing the sweepstakes. h.Four (4) tickets to ICE! attraction at Gaylord Opryland Resort and Convention Center and two (2) nights’ shared accommodation for four (4) people at the Gaylord Opryland Resort & Convention Center (total approximate retail value of USD716.00). Winner must travel on the dates determined by the Sponsor in its sole discretion or the prize will be forfeited. Travel must be round trip. Total approximate retail value of the prizes collectively is USD3,296.00. 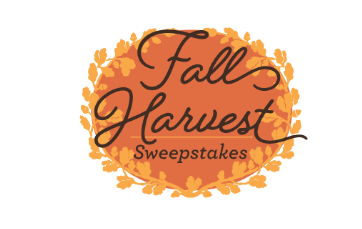 Hallmark Channel® Fall Harvest Sweepstakes – Win a trip to Milwaukee! Win a trip to Milwaukee, WI! ENTRY LIMIT – Limit: Entrants may enter in this manner once per day throughout the promotion period, regardless if the entrant has more than one email address. SWEEPSTAKES ENTRY PERIOD – The Hallmark Channel® Fall Harvest Sweepstakes (the “Sweepstakes”) begins at 9:00:00 AM Pacific Time (“PT”) on Monday, September 18, 2017 and ends at 8:59:59 PM PT on Monday, October 23, 2017. 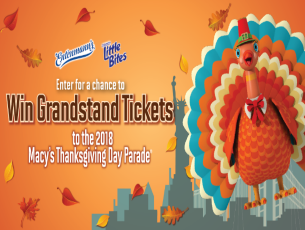 PRIZES – Grand Prize: One (1) Grand Prize winner will receive a trip for two (2) (i.e., winner and one (1) guest) provided by Delta Vacations, to Milwaukee, WI. Actual value of trip depends on location of winner’s primary residence, destination, fares at time of travel and land accommodations. If actual value of the trip is lower than ARV stated herein, the difference will not be awarded. Round trip Delta Vacations Main Cabin airfare for Grand Prize winner and one (1) guest to/from the closest commercial airport located in the 48 contiguous states and nearest to winner’s primary residence to Milwaukee, Wisconsin. ARV of Grand Prize: $3,000. 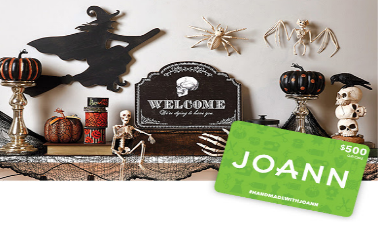 Joann Quikly Sweepstakes – Win a $500 Joann gift card! SWEEPSTAKES ENTRY PERIOD – The opt-in period begins on October 9, 2017 at 5:00 a.m. Eastern Time (“ET”) and ends as soon as the live release in the Quikly campaign, which shall be no later than October 18th, at 11:59 p.m. ET but could end sooner. All others to respond: One 55% off any one regular-priced item. Wet Ones “Wish I Had a Trip to Universal Orlando” Sweepstakes – Win a trip to Florida & more! Win a trip for 4 to Universal Orlando Resort in Florida! ENTER SWEEPSTAKES HERE – Wet Ones Sweepstakes page. ENTRY LIMIT – LIMIT: One (1) Entry per person/email address per day. ELIGIBILITY – The “Wish I Had a Trip to Universal Orlando” Sweepstakes is open only to individual, legal residents of the 50 United States and the District of Columbia (“D.C.”), who are 18 years of age or older as of the date of entry (19 or older in AL and NE) at the time of entry. SWEEPSTAKES ENTRY PERIOD – Sweepstakes begins at 12:00:01 p.m. Eastern Time (“ET”) on 7/15/17 and ends at 11:59:59 a.m. ET on 10/31/17. PRIZES – One (1) Grand Prize: (“Prize”) a four (4) day, three (3) night trip for Winner and up to three (3) guests (“Guests”) to Universal Orlando Resort™ in Orlando, Florida (“Trip”). Trip will include: round trip economy class air transportation for Winner and up to three (3) Guests from a major commercial airport near Winner’s home (as determined by Universal Orlando in its sole discretion) to Orlando, FL*; three (3) nights standard hotel accommodation (one room, quadruple occupancy, room and tax only) at Loews Sapphire Falls Resort or at another on-site hotel (as determined by Universal Orlando in their sole discretion); non-exclusive ground transportation to and from airport and hotel in Orlando, FL; 3-Park 3-Day Park-to-Park theme park tickets for admission to Universal Studios Florida and Universal’s Islands of Adventure theme parks and Universal’s Volcano Bay water theme park for Winner and up to three (3) Guests; and admission to one (1) Blue Man Group Show (exact date and time to be determined by Universal Orlando in their sole discretion) for Winner and up to three (3) Guests. The Approximate Retail Value (“ARV”) of Prize is Three Thousand Five Hundred Seventy-Six Dollars and 19/100 Cents ($3,576.19). Trip must be completed by October 31st, 2018 or Prize may be forfeited. Dominos Quikly Sweepstakes – Win 5 $100 Dominos gift cards! 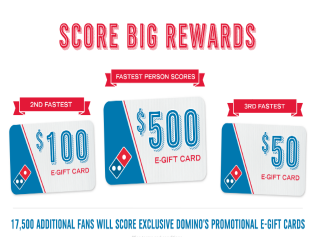 Win 5 $100 Dominos gift cards! ENTER SWEEPSTAKES HERE – Dominos Quikly Sweepstakes page. SWEEPSTAKES ENTRY PERIOD – The opt-in period begins on October 2nd, 2017 at 12:00 a.m. Eastern Time (“ET”) and ends as soon as the live release in the Quikly campaign, which shall be no later than October 23rd, 2017 at 11:59 p.m. ET but could end sooner. The grand prize (five $100 gift cards), first (one $100 gift card) and second (one $50 gift card) prizes do not expire. All other prizes are promotion e-gift codes which are valid through October 23rd, 2017 at 11:59 pm ET.